Chickpeas are so versatile in vegetarian cuisine. I always keep dried chickpeas in the pantry that can be soaked overnight and simmered the following day but for those days when I am running out of time, canned chickpeas are terrific to keep in stock. 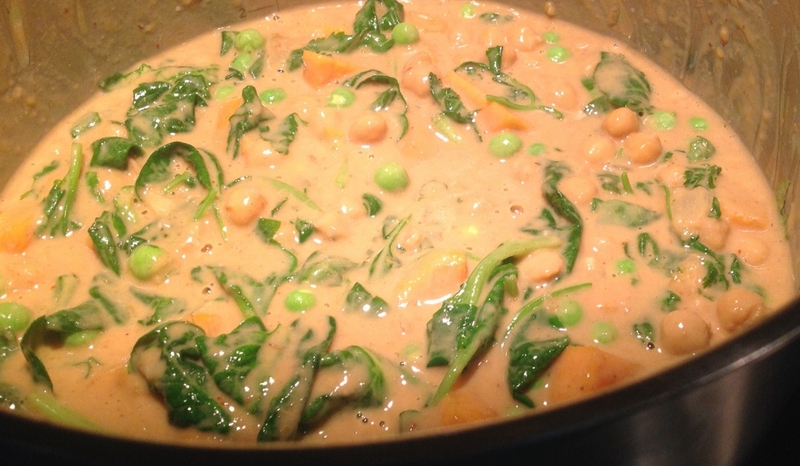 This recipe uses my favourite Thai red curry paste (can be found in the Asian section of the supermarket), blended into a creamy curry with coconut milk, orange juice and smooth peanut butter. The combination is a taste sensation that you have to try to be believed. Received a thumbs up around my dinner table. Sweet Potato Chickpea Curry is from the website of the popular Canadian Chef Michael Smith; he is certainly someone to look up to — standing tall at 6 foot 7 inches; he believes in creating a base for his recipes and invites the cook to create variations on his theme. Sweet potatoes and chickpeas are the base to this recipe. The aromatics are a combination of chopped onions, garlic, grated ginger and Thai red curry paste. I used peanut butter but any other nut butter that you prefer will work well also. 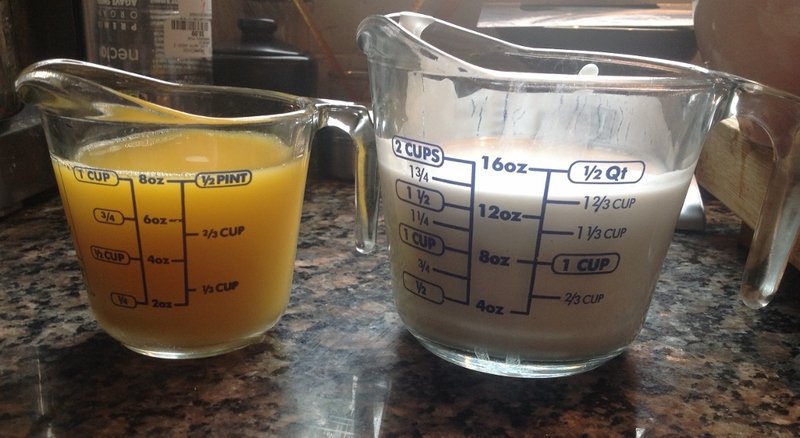 The liquids are orange juice and canned coconut milk. Prepare the greens to be added at the end of cooking: fresh baby spinach, fresh or frozen green peas and a bunch of chopped coriander. Sauté the onions and garlic in a tablespoon of oil until browned, about 5 minutes. Add the grated ginger and Thai curry paste and continue cooking until you can smell the fragrant spices. 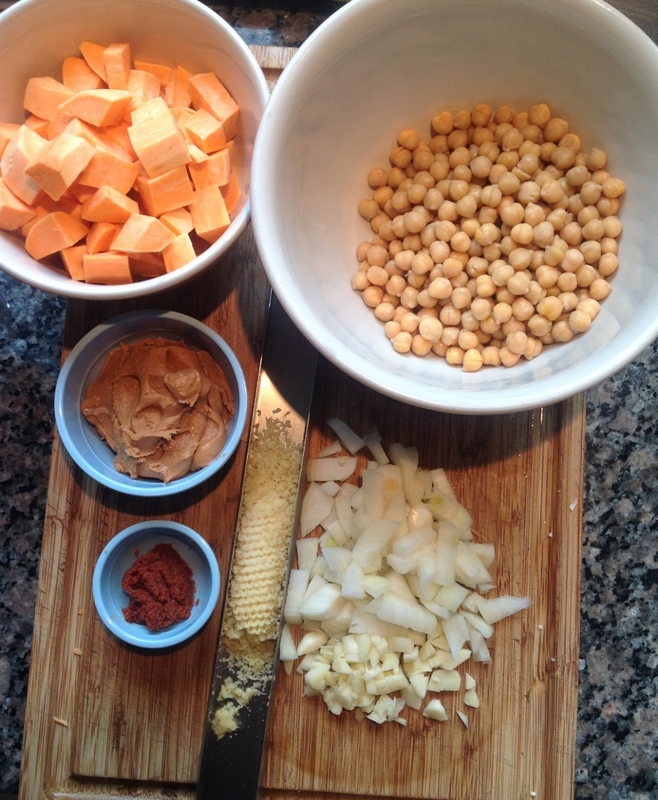 Add the sweet potatoes, chickpeas, coconut milk, orange juice, peanut butter and a pinch of salt. Bring the pot to a boil, then lower heat and simmer for about 30 minutes, until the sweet potatoes are tender. Right before serving, stir in the spinach, peas and cilantro. Beautiful shades of orange and green. Cook up some brown or white rice and spoon on the curry. Delicious and easy to put together. Hope your family enjoys it as much as mine did. This is now a regular meal in my home. Add the oil to a stockpot over medium-high heat. Sauté the onion and garlic until lightly browned, about 5 minutes. Add the grated ginger and the Thai curry paste into the pot. Continue cooking until the spices are heated through and fragrant, another few minutes. Add the sweet potatoes, chickpeas, coconut milk, orange juice and peanut butter and salt. 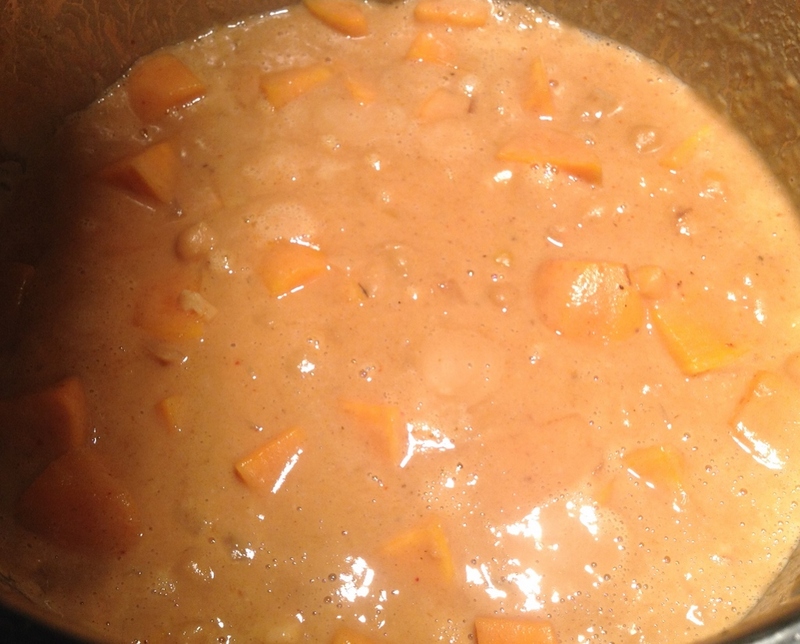 Bring to a simmer, lower the heat and continue simmering until the sweet potatoes are tender, about 30 minutes. Stir in the peas, spinach and cilantro. When are you having us for lunch. yum. I can smell it over here. So colourful and not too difficult to put together I think. The colours really add to the enticement of this dish! I can almost smell and taste this dish. A must try! Please do! It’s easy and I’m sure most of the ingredients are already in your pantry! Yum, will definitely try. Thanks! This is definitely your kind of meal! Enjoy! ← Mediterranean Salad with Spiced Chickpeas, Please!